February is all about showing your loved ones how much you care but let’s remember that we can’t pour from an empty cup — we must take care of ourselves and our health first! Self-care has become a large movement (just search #selfcare on Instagram and you’ll see how popular it has become), so this February — which is also American Heart Month — we want you to know how to improve your heart health with the ultimate practice of self-care: Yoga! It’s no secret that Yoga provides many physical and emotional benefits. It has been practiced for thousands of years and has been thoroughly documented to increase flexibility and strength, relieve stress, and calm the body and mind. Yoga has even become a popular prescription given out by physicians for a variety of conditions. 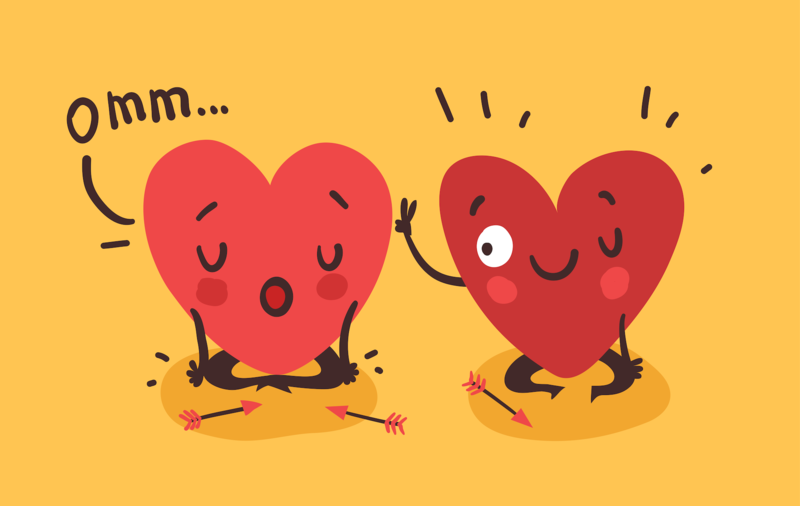 And certain poses (or asanas) and practices can directly impact your heart’s health in a positive way. So, why does heart health matter, and why should it matter to you? Heart disease is the leading cause of death among American men and women — 1 of every 4 deaths is caused by heart disease (CDC — https://www.cdc.gov/heartdisease/facts.htm). About 735,000 people have a heart attack every year in the US, 525,000 being first-time attacks and 210,000 occurring in people who have already had a heart attack. High cholesterol, high blood pressure, and smoking are major risk factors for developing heart disease, and about half of all Americans have at least one of these risk factors. Other risk factors include diabetes, poor diet, obesity, stress, lack of physical activity, and excessive alcohol consumption. Your heart’s health doesn’t have to be risky — by taking measures to minimize your risk of heart disease now, you are adding years to your life and many more Valentine’s Days to celebrate with your loved ones. Now here’s the good stuff — a daily practice of Yoga (or as I often call it, YogAAHH) can minimize your risk of developing heart disease. It improves blood circulation, lowers cortisol levels (stress is a known risk factor for heart disease), and in recent studios has shown to lower levels of LDL (the “Bad” cholesterol). Improving all of these things will help to minimize your risk of developing heart disease. (Baddha Konasana) Improves circulation by stimulating the heart, therapeutic for high blood pressure; helps to relieve mild stress and anxiety. (Setu Bandha Sarvangasana) Opens the chest and the heart; helps to lower blood pressure; relieves mild anxiety/stress. (Bhujangasana) Invigorates the heart; helps to clear the passages of the heart and lungs to breathe better. (Ardha Chakrasana) Improves heart function and regulates blood pressure. 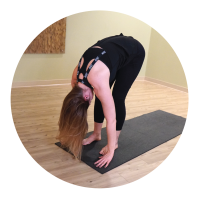 (Uttanasana) When held in a static position, this pose challenges the heart to regulate blood flow. Therapeutic for high blood pressure; challenges the heart to regulate blood flow. (Adho Mukha Svanasana) Can help relieve mild stress/anxiety/depression; therapeutic for high blood pressure. 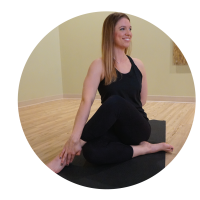 (Ardha Matsyendrasana) In addition to being a strong opener for the neck and shoulders, this pose stimulates the heart and lungs. (Virasana) Therapeutic for high blood pressure; calms the mind and body. 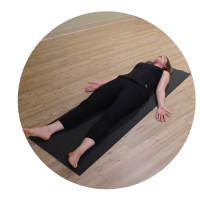 (Savasana) Calms the body and the mind; helps relieve mild anxiety/depression; helps to lower blood pressure. (Viparita Karani) Elevating the legs helps with the drainage of fluids built up in the body; gravity helps blood return to the heart and helps improve circulation and to lower blood pressure. Slower breathing has been shown to help lower resting blood pressure, ease anxiety and reduce stress, all contributing factors to heart disease. Inhalation fills lungs with fresh air, increasing oxygen supply to cells and invigorating the body; Exhalation rids carbon dioxide in lungs and calms the nervous system. Sitting meditation has been shown to ease anxiety and stress, promote better sleep quality, and promote your overall well-being. Some studies also point to lower blood pressure and heart attack risk as potential benefits (but more studies are needed for empirical evidence of these effects). 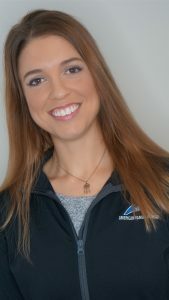 It is easily accessible and can be practiced anywhere with minimal risk of injury, so if certain asanas are contraindicated in your practice, consider a regular meditation practice to improve your heart’s health.A daily practice is recommended to reprogram your body and see improvements in your physical and mental health. 10-15 minutes a day is sufficient, but if you want to practice longer, go for it! Your heart will be grateful. Sun Salutations consist of a series of postures performed in a continuous flow and connecting the breath to each movement, further developing the mind-body connection. 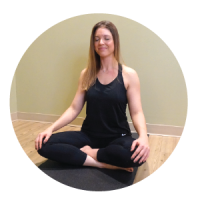 There are many variations, and the cycle provided here is an introductory or basic flow suitable for most fitness levels. 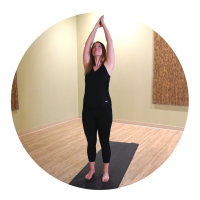 Sun Salutations are great near the beginning of your practice to warm the body and stimulate circulation through the body. Sun Salutations also provide a mild cardio effect and can help increase exercise capacity. Disclaimer: Consult with your physician to assess your risk for heart disease. While some poses are great for maintaining heart health, they may be contraindicated for those already diagnosed with heart disease or other medical conditions. Always consult with your physician prior to beginning any exercise program.